Designed to meet the specific needs of the modern bar, it is particularly suitable for preparing smoothies, fruit and vegetables drinks. – white or chrome body, no edges or seams for easy cleaning. – transparent, unbreakable 1,5 lt Tritan container is dishwasher safe and graduated with litres and UK/USA gallons. – tight rubber lid with feed opening to add ingredients while the blender is working. – metal and rubber gears drive gives a high power transmission and quiet operation. – 4-blades stainless steel knife can be easily disassembled. – safety microswitch on the lid. – speed control on request. – seamless stainless steel body for easy cleaning. – 4 blades stainless steel knife can be easily disassembled. Professional mixer designed to cater for specific requirements of bars, restaurants, cafeterias, etc., particularly suitable for preparing whips as well as fruit and vegetable drinks, creams, soups, sauces, shakes and to homogenize, prepare sauces, etc. • Machine body in stainless steel. • Membrane sealing system to prevent fluids from entering the machine. • Powerful motor with forced ventilation, for prolonged use and enhanced durability. • Magnetic safety micro-switch on glass lid without forced position. • Siliconic membrane controls with ON, OFF Pulse button and NVR device. • 5-Litre round glass in stainless steel. • Glass lid in PE and sealer, locked with hinges and with plug for adding ingredients. • Stainless steel transmission hub body; can be easily separated from the glass body for easy cleaning. • Cutters shaft supported by bronze bushes. • Metal driver with opposing teeth, ideal to withstand processing of hot products. Professional mixer designed to cater for specific requirements of bars, restaurants, cafeterias, etc. • Extruded aluminium machine body and sides in ABS. • Membrane sealing system to prevent fluids from entering inside the machine. • 2-Litre square glass made in unbreakable transparent material, graduated in litres, UK and U.S. gallons. • Very practical, with possibility of pouring in 3 different directions, ideal in the preparation of frozen drinks, Smoothies with syrups and concentrates. • Glass lid in rubber with plug for adding ingredients. • Cutters shaft supported by ball bearings to prevent overheating and to guarantee enhanced durability. • Star drive in high-resistance sintered steel. • 4-Spoke cutter obtained from a single pressing of hardened steel for blades also suitable for crushing ice. • The square glass was designed for optimal operation with large quantities of ice, even of the dry type. • Practical and functional: the product can be poured in 3 different directions. 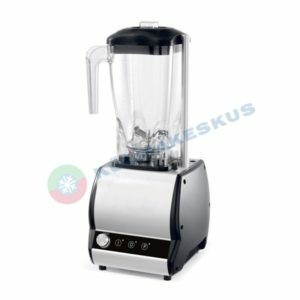 • Ideal in the preparation of frozen drinks, Smoothies with syrups and concentrates. • Multi-point motor drive in stainless steel. • Orione Plus: electronic version with 9 pre-set processing programs.